Baking with a cause: YOU and getting you back in the kitchen too! I say selfishly because I do have some fabulous cake recipes. My favorites are my sponge cake recipe and the mini-vanilla filled cupcakes. But really, I have been longing for layer cakes due to their versatility. My favorite cakes have always been white layer cakes. It’s true! Even since I started making cakes in our house when I was in elementary school. (I did a fine job of both trashing the kitchen and baking a decent cake.) 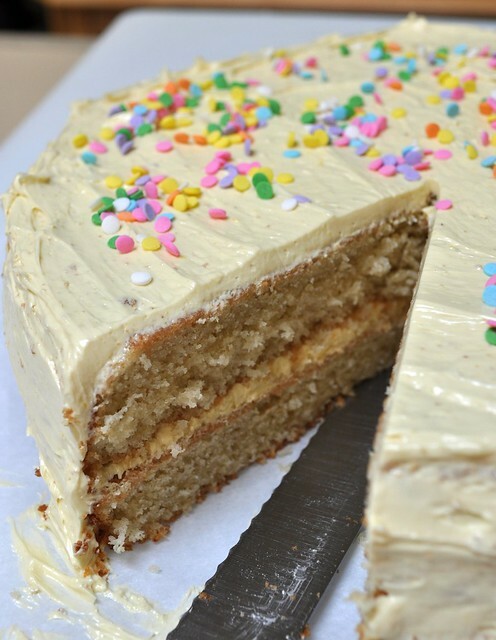 My favorite white cake recipe is still being worked on to convert it to gluten free. I needed some help. And some inspiration. And I say that reluctantly because I know that some very fabulous people in my life have made some incredible flourless chocolate cakes for me (birthdays at work, etc). I’ve eaten each slice with a smile. But I have a confession to make: I’ve never liked chocolate cakes. At the age of six, I completely overindulged: chocolate cake + chocolate ice cream + first day in new state/neighborhood/house = bad news for the future of chocolate cake in my life. I am refraining from using details here … after all, this *IS* supposed to be a food blog. So you see, I am selfish in my quest for the *perfect* gluten free non-chocolate cake. I’m not the only one who realizes the beauty of a white cake – the versatility, etc. Oh yes. A white cake is where it is at, people! And you will see from this month’s ratio posters just how fabulously versatile it is! I fell on a sword this month taste-testing over 9 cake recipes ideas in four weeks. Not too pointy of a sword, mind you. If the cake tasted great, but failed? I have crumbled them into a baggie and made some “cake pops” for my daughter(s) and I. We share one “cake pop” after swim lessons. But I think I’m going to have to invest in some swim time for myself after a month of cake eating. Ay ay ay! I’ve discovered a few things about cake baking – especially gluten free cake baking – that I’d taken for granted previously. Watch your baking time CAREFULLY and check often – especially within the last 5-6 minutes. An over baked gluten free cake = the Sahara Desert in your mouth. Have your eggs and butter at room temperature. But don’t do this if you live without air-conditioning and your house is 80F. Not cool. Parchment lined/bottomed cake pans are just as fabulous as dusting them with gluten free flour – and easier for me. Gluten free cake batter is definitely thicker than gluten-filled cake batter. Don’t stress when you see it. And most importantly: the RATIO makes a difference. You really do have to measure the flours by weight if you are going to change up the flours you chose to use. If you see a cake within the several that will be shared today as part of the rally, please do take the time to use the flours they chose to use. For each of the cakes I made, I used 228g of flour. Sometimes this was the equivalent of 1 cup of rice flour + 1/2 cup tapioca flour OR 1 cup of rice flour + 1/3 cup potato starch OR 1 cup millet flour + 1/2 cup + 2 Tablespoons sweet rice flour. Yikes. I wanted to make a cake that anyone could make with readily available flours that are relatively inexpensive as far as gluten free flours go. I wanted it to be something your best friend could make for you or your mom or your colleague if they wished to. So many times our diet is intimidating and expensive. I just wanted to simplify it all. (And I’m not going to tell you about my initial starts of using whole grains, less sugar, etc because <girl smacks self in head now> I was making a cake. I gave myself permission not to think about applesauce in lieu of butter, etc. I just wanted a cake. And a good one at that. I ended up with several. From one recipe too. The basic cake. With only the primary frosting on. I had intended to frost this further, but the Chicklet got a hold of the sprinkles and she went to town. So, it stayed just like this: minimal frosting and a fabulous crumb. 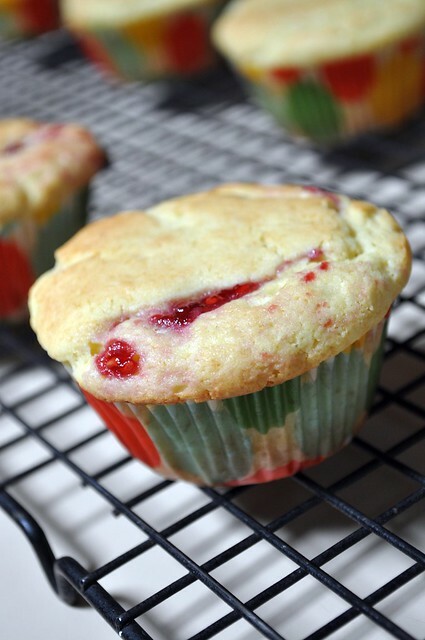 For these little cupcakes, we filled them with a dollop of raspberry jam – (and some with Nutella – YUM!). No frosting was needed. 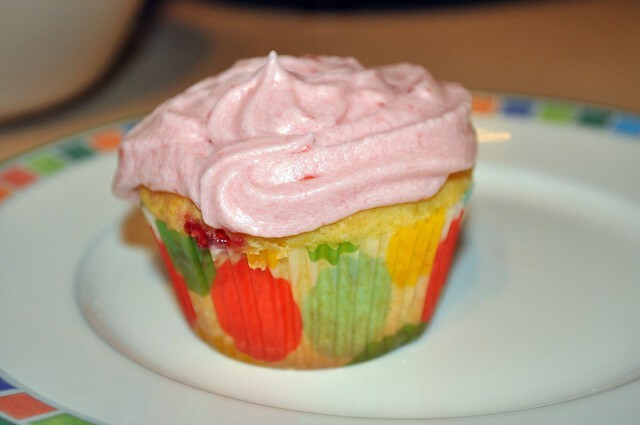 Similar to the one above, filled with sliced strawberries and topped with fresh strawberry buttercream frosting. All things pink are met with approval from the Chicklet. I’m not convinced that I’ve achieved the cake I dream of. But, in looking at the titles of the cakes of my fellow GF Ratio Rally participants, I see that I have a fabulous future of cake testing ahead of me. (Tiramisu! Confetti Cake! Lemon Tea Cake! – just to name a few!) Maybe one of you will find a way to make it even more fabulous. That is the beauty of being a gluten free community: learning, sharing and growing together. Preheat oven to 350F. Line the bottom of two 8 inch cake rounds with parchment paper OR butter each and flour with rice flour (NOT the rice flour called for in the recipe – please use 1 Tablespoon or 2 in addition to that called for in the recipe). Beat butter in the mixer until light and creamy. Add sugar. Beat again for several minutes (3-4) on medium until light and fluffy. Add one egg. Beat for 2 minutes. Add next egg and beat again 2 more minutes. Repeat until all eggs have been incorporated thoroughly. Sift together flour(s), baking powder and salt. Add to cake batter. Mix in carefully so as not to lose the softness created from mixing in the eggs/sugar. Bake until the top is just golden brown and a toothpick (or cake tester) inserted comes out shiny but not sticky – about 18-20 minutes. Check your cake as you approach the 15 minute mark at a minimum to avoid over-baking. Remove from pans by flipping on to cooling racks after removing from the oven. Allow to cool completely before frosting. GF Traditional Birthday Cake by Karen @ Cooking – Gluten Free! love your post, tips and recipes!! and thanks for hosting us, kate… yay for cake! Thanks for hosting this spectacular cake post. 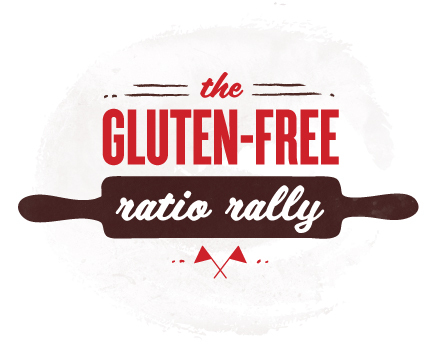 I’m off to check out the other great GF Ratio Rally Cakes! I made white cake too…I just love it so…yours looks fantastic! Thank you! I’ve been looking for a good gf white cake recipe. I agree with you on just wanting a good GF white cake recipe. I just made the GF yellow cake recipe from the King Arthur flour blog. I used the homemade flour mix in the notes of the recipe. We frosted the cake with a quick buttercream (also KAF”s recipe) for my little girl’s birthday. It was great! Can’t wait to have another excuse to have cake….. I definately learned the lesson about cooking a few minutes too long. I actually baked a yellow cake with chocolate frosting for the rally and was distracted and let it go too long in the oven. Good lesson to learn! Love your creativity and ideas. I don’t mind a really rich, dense chocolate cake that is basically just like eating chocolate, but I don’t like a cake that’s called chocolate just because it’s got a spoonfull of cocoa in it. I much prefer a cake like yours- it looks yummy and has a terrific looking texture in the photo with it cut. I love your ratio too, how simple and I’ll be able to remember it when I’m in a hurry at work, Great job! Your cake looks wonderful, Kate. It looks like a perfect balance of moisture with a nice crumb, too, which is all important:) Thank you for hosting us this month! KateAlice. Kate, what a great post! I love the options you give and the cake looks delicious with a perfect crumb – and I like the sprinkles! 🙂 Thanks for hosting us! Your blog is simply amazing! You have given me new inspiration because I was feeling mighty lonely eating GF for the last couple of weeks. I love the variety of recipes you have and think I will have to start trying some of them soon. Thanks for the great ideas! I love having one great tasting white cake recipe – that way you can add different flavors to create different cakes, without having 40 different recipes in your book. Looking forward to trying it! one way to add the eggs one-at-a-time and still appease the chicklet…..
crack them ALL into a little liquid measuring cup (or a gravy boat…something with a handle AND a spout)…they will “pour out” one at a time into the mixing bowl. I DO NOT MISE-EN-PLACE, except for eggs!! missing you, miss kate! your blog keeps me “close” to my friend!! mmm looks delicious. 🙂 Will have to think up a reason to celebrate and have cake. Thank you for this post. I miss good white cake-particularly coconut frosted cake! Often, I will see one at Winco, and go visit it, and say, “I love you.” It makes my husband smile. I will be experimenting with this cake list. Wow your white cake looks delicious!!! I have a problem with baking bread. I´m gluten intolerant and have been trying quiet a lot of flours/recipies etc. I haven´t even tried a loaf as yet, I would like to just get some bread rolls up!!! If I can have some success with just the rolls it would be fantastic. Also I find that the bread I do bake has an aftertaste of yeast. And yes I have tested my dry yeast and it´s fine. Even bought more to be sure. I´m australian and living in Santiago, Chile. I cannot get all the flours, but most yes. Please help me down here?????? Does your GF mix have xanthan gum? If yes, then you MIGHT be able to replace it cup-for-cup but MUCH BETTER would be to calculate total weight and try it. Cakes tend to use more starch than whole grain to get a lighter texture. SOOOO.. I am a bit worried that your regular GF mix is more set for things like quick breads, muffins and pancakes rather than cakes. I used the rice flour/potato starch variation of this recipe and it tastes great! It’s crumbly, like all gluten free cakes, but it’s quite moist and has good flavor. Thanks for the recipe, I love it! Forgive me, as I’m still somewhat new to this… when you say “rice flour,” what type of rice flour do you use? Sweet rice flour? Brown rice flour? Brown or white rice flour, but not sweet rice flour. Hey all these recipes look great, but I am looking for a really WHITE GF cake recipe–the kind that gets frosted with white fuffly frosting and dusted with coconut. . . .soft and moist. When there are egg yolks, or butter in the ingredients I know it won’t be that white (like angel food). Does anyone have a good recipe for a white angel food cake that is GF? Another salad…ho hum I wanna be done. 50% of the donations to this site are given to my local food bank to support their Gluten Free Shelf. The remainder goes directly into our gluten free food adventures (aka feeding my family of four) fund. :D THANK YOU! This work is licensed under a Creative Commons Attribution -Noncommercial-No Derivative Works 3.0 License.